A lot of silly dancing by Mojo and the crowd was in fact hype. This was was a much longer match than the two of them are used to. Royce won via submission with her new hold. She has been working singles matches lately and has done a good job. This was a good match where Patrick even countered Riley's finish in to what looked like an RKO. The place bit on the near fall and was really pulling for Patrick before Riley got the win. It was billed as an intergender match, but that's just NXT speak for a mixed tag match. Crowd was in to this, getting fired up for every tag and when Enzo hit the big splash for the win. Zayn won with the Helluva Kick in an excellent match. One of the best 1-1 live event matches I've ever seen. 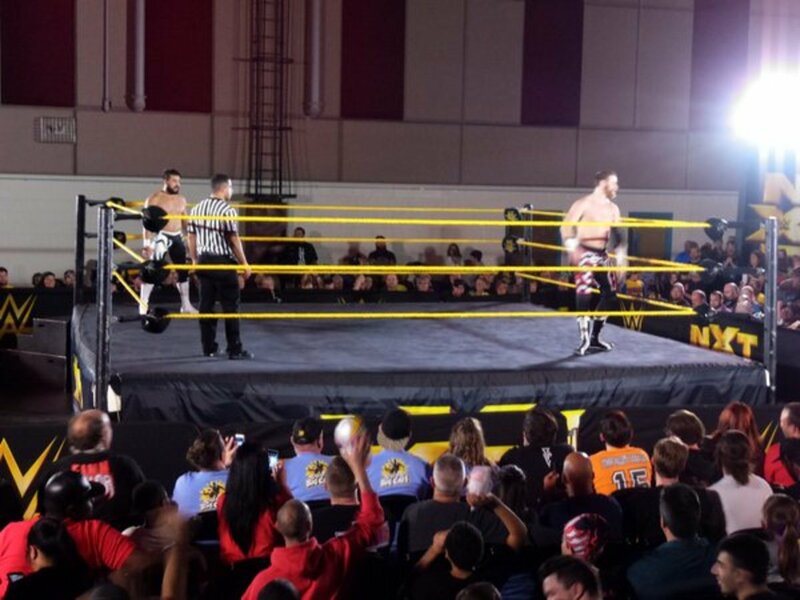 They did mat work early, both teased dives to each other to the outside, Sami with his flip back in to the ring, Manny with his Tranquilo Lounge on the middle rope. A huge Blue Thunder Bomb for a near fall followed by some strong chops took us to the finish where Sami hit the Exploder in to the corner and ran in for the kick to win it. Post match Sami raised Manny's hand and the two embraced. - Dallas Harper did a promo about being 6'9" and "Ohhhh so fine". He was heckled by the crowd with a "Where's Your Shirt" chant. This was a short, painful match. Nia destroyed her. This was a very good match that got a lot of time. The action was well paced and the heels kept just enough heat on the faces to keep everyone rooting for them to wage their comeback. Gable scored the pin on Dash with the assisted suplex for the win.